On his program, One World for Newswire.fm, Deepak Chopra has had the opportunity to sit down with a variety of guests from a multitude of fields to discuss their successes and the projects they support. Deepak is no stranger to success stories though; beyond his own highly successful career, there are a number of successful entrepreneurs and philanthropists in his own family. 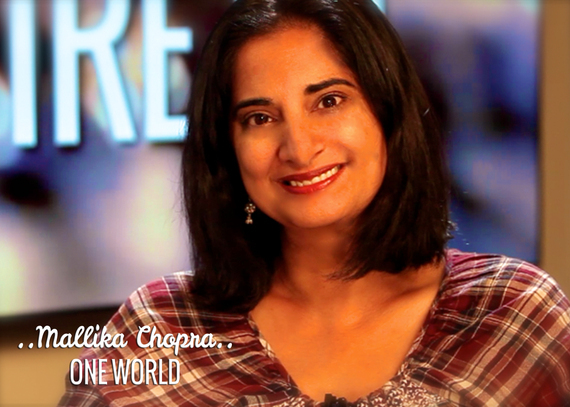 In a very special episode of One World, Deepak shared with us a conversation with his daughter; Mallika Chopra. "My dream job was a job with MTV; something that most people would not think that Deepak Chopra's daughter would be in too, but I loved music and I loved television so I pursued a job relentlessly." Mallika did get a job with MTV in New York and then eventually ended up being asked to help launch the station in India. Despite the success she had bringing MTV to some of the most remote corners of the globe, Mallika realized that this was not her passion. She was destined for other things. "You taught us about the power of intention," Mallika recounted to her father. "When we were young, you will remember, after we meditated you had us say 'I am responsible for what I see, I choose the feelings I experience and set the goals I will achieve and everything that seems to happen to me I ask for and receive as I have asked." It is something that stuck with her and has been a thread throughout her life. Her first book lay out her intentions as a parent and now, intent.com is a vibrant online community where people all over the globe can come together and share their intentions and support each other on their journeys to achieving them.